1. 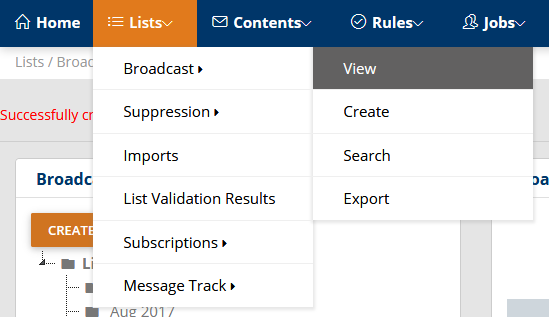 After logging into the application, select the “Create” option within the “Broadcast” section by hovering over the “Lists” tab above. 2. Name the list you are creating. Max Temp Bounces (short for Maximum Temporary Bounces) is only useful for Broadcast Lists and controls the behavior of your list when messages to list members bounce. A "temporary" bounce is something such as an unavailable mail server, an overfull mailbox or another similar delivery failure to which a future delivery may well succeed. 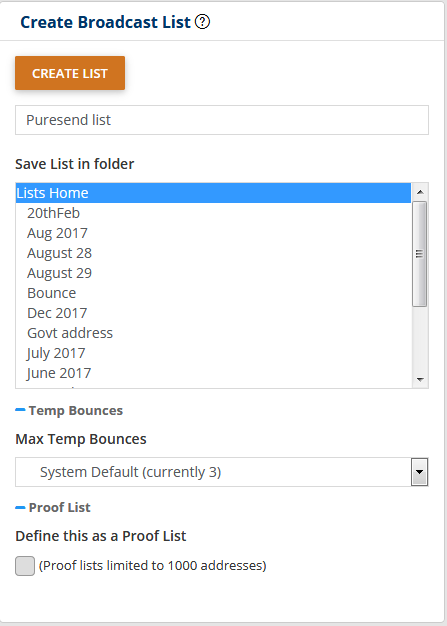 If you would like for list entries in this list to be marked as "permanent" bounces after three temporary failures have occured, set this value to three. Define this as a Proof List By checking this checkbox we can use this as proof list to send test emails. 3. 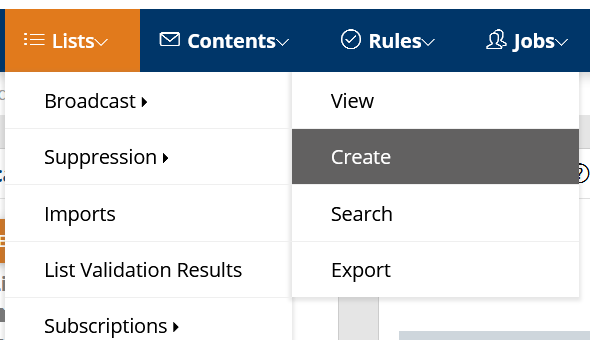 Custom Fields are names that you can give to the customizable columns in your lists. 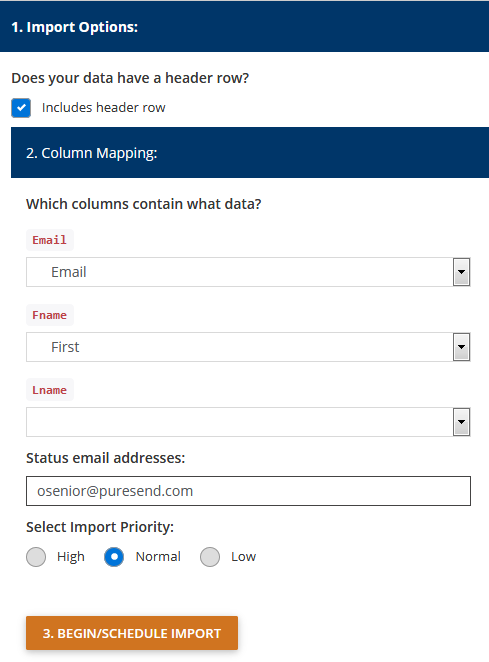 In addition to the standard list columns (name, company, email and so forth), you can use these columns to store data such as user ID, customer number or any other value which you would like to track. 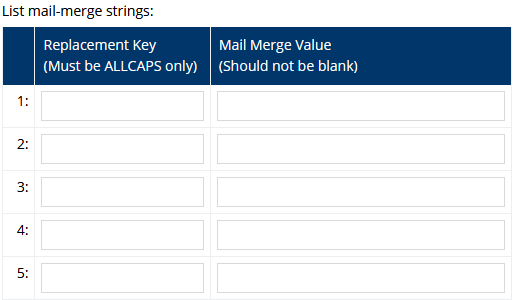 The values stored in these fields will be available to you in mail merges when you create broadcast messages.You can add/remove, change, or edit any of the fields, depending on how your list is set up in your file. 4. You may also add, “List mail-merge strings:” to your list. 5. Click the “Create List” button. 6. To see the list you’ve just created, select the “View” option within the “Broadcast” section by hovering over the “Lists” tab above. 7. 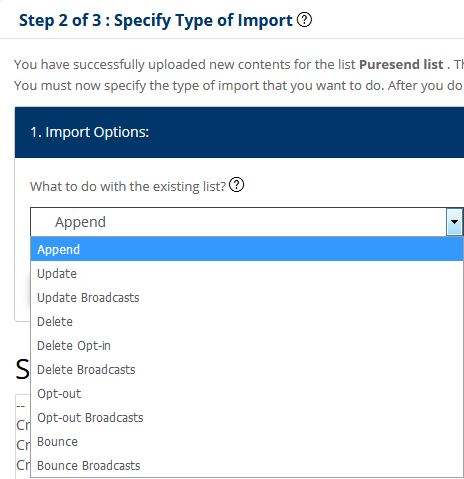 Find the list you have just created and select “Import to this list” from the drop down menu to the right. 8. Choose the file you wish to import. 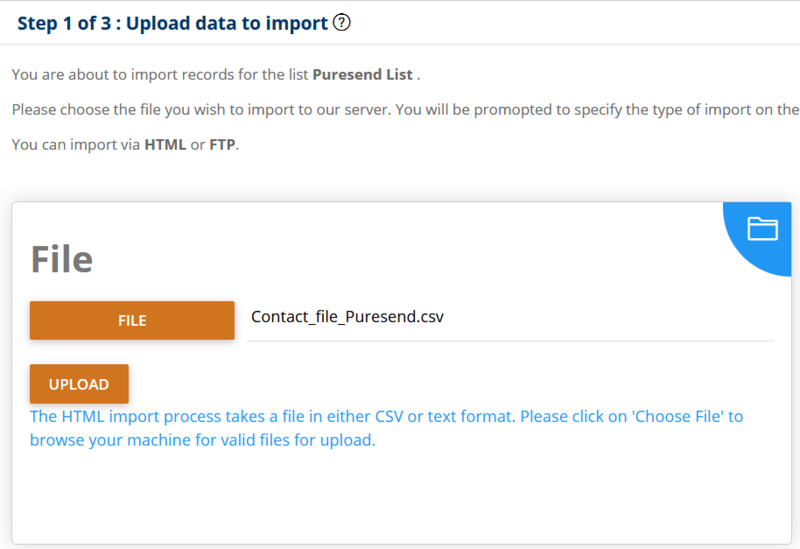 The import process takes a file in CSV (Comma Separated Values) or text format only. If your original sourcedata is stored in Microsoft Excel, you can save it in a CSV file by using the "Save As..." feature in the File menu. You will then be presented with another page allowing you to specify the type of import that you want to do. Also you can import file using FTP. 9. You must now specify the type of import that you want to do. After you do this, you will be asked to configure the import data. 10. You must now specify the format of the data you have uploaded. After you do this, the import process will be started, and will proceed in the background barring any errors. Be sure to select the correct fields that match. For more details on this, see List Import Configuration. 11. You have successfully uploaded new contents for the list. After you do this, the import process has started, and will proceed in the background barring any errors. Hence, you will be able to use the web interface, but the import process will be proceeding and results may not be immediately apparent. To check on the status of your import, select the “Imports” option from the “Lists” tab above.